Imagine Animal Doctor / Imagine Pet Vet puts you in charge of your own veterinary practice. Is this game top dog or the runt of the litter? Find out here! Imagine Animal Doctor (Imagine Pet Vet in Europe) puts the player in the shoes of Sally the vet, a young graduate who is just starting her first veterinary practice. Ubisofts Imagine games have been criticised by some for gender stereotyping. Caring for cuddly fuzzy little animals might be atypically girl-like behaviour, but aspiring to be a vet is a noble ambition for any young person, especially considering the dedication and hard work that is required to learn and to practice veterinary medicine. Will Imagine Animal Doctor inspire young would-be vets? Read on to find out. 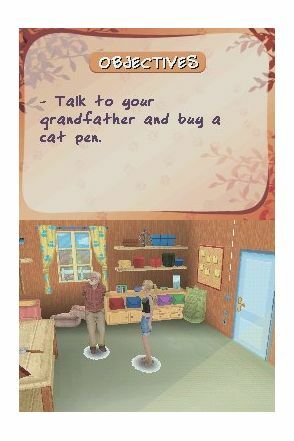 Starting with just a reception area and a few barren patches of land, your first task, as Sally the vet, is to speak to your grandfather and get him to construct you a cat pen. Once this is done, customers will start to bring in their sick and injured felines. At this point, you are required to do a diagnosis and this is certainly the most fun part of Imagine Animal Doctor. To perform a diagnosis, you are required to play anywhere between two and six mini-games. Each of the mini-games simulates a typical activity a vet might carry out while trying to diagnose a sick animal. The mini-games are well presented and while we are sure a real vet will tell you that they aren't realistic, they do at least fit perfectly with the context of the game. Amongst several other activities, you'll find yourself blowing onto the DS microphone to encourage fleas and mites to show themselves, before scooping them up with tweezers and then picking up skin samples for analysis. There are also x-ray's to investigate, ultrasound scans to do (done by rubbing the screen with the stylus) and temperatures to take. You'll even be required to guide endoscopes down into the stomachs of your unfortunate animal patients. Most of the games are easily mastered and some are ridiculously easy, such as the scales mini-game which simply has you tapping a button until the scales register the correct weight for the animal. The only mini-game we struggled with was the microscope, which must somehow be focused by dragging two dials with the stylus, but the controls were so fiddly that we never managed to get the splodges in focus, not that anyone really knew what they should look like in focus anyway. Perform the examination correctly and the animal is admitted to your hospital. Fail and the customer will take their sick pet elsewhere. During our examinations we encountered all sorts of animal illnesses, such as conjunctivitis, hernias, tapeworm and colic. Now, while I had a good idea of what a hernia was, I didn't know that a nematode was a kind of worm. Disappointingly, the game doesn't tell you anything about either the conditions you diagnose, or some of the specialist equipment that you use to treat your cute little patients. It's not hard to imagine that any child playing this game would be sufficiently interested enough to read a paragraph or two on what nematodes and otoscopes actually were. It's a shame that Imagine Animal Doctor doesn't take this opportunity to be a little educational. Children who especially want to care for animals might take the time to research the conditions on the Internet, but most will have forgotten and moved on with the game by then. While the mini-games are generally well presented, they do quickly start to repeat a little too often. Then again, there's only so many ways you can check an animals health. No matter what the diagnosis, even for something as simple as a cold, the poorly pet is then checked into your animal hospital, where the after-care can begin.